The Soundcraftsmen PCR800 is one of a kind. It was introduced sometime in the early 1980s, presumably for the hi-fi market. Till today, there’s nothing like it. What is so special about this amplifier is the PCR part, which is an acronym for Phase Control Regulation. To understand this term better, it means the power supply is Regulated. And this regulation is made possible by controlling the phase angle of the thyristors feeding the filter capacitors, hence the term Phase Control Regulation. Removing the top cover shows the Phase Control Regulation board bolted to two capacitors hidden underneath. The four shiny disks beside the power transformer are the thyristors. They replace the traditional bridge rectifier that is found in an unregulated linear power supply. Let’s take a closer look at how this phase control regulation works. At the bottom left are the four thyristors for full wave rectification. The transformer secondaries are connected at the left. They are at 68-0-68Vac. After rectification, the output is at +/- 70Vdc. This voltage is regulated, meaning it doesn’t sag under load. I can verify this because when I bench tested this PCR800 at full power into an 8Ω dummy load, the supply rail voltages stayed at +/- 70Vdc. The red box at the top is the phase control section. This is the heart of the PCR. This circuit controls the firing of the thyristors. Since the voltage is regulated at +/- 70V, it indicates that the thyristors are fired before 90°. There is a +/- 25V headroom in the power supply because in a conventional, non-regulated linear supply, the output will be at +/- 95V. The circuit enclosed in blue is for temperature sensing. 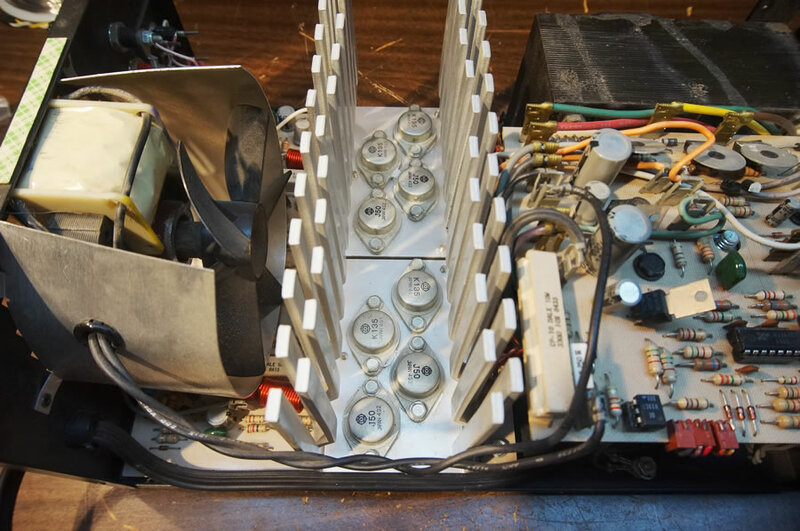 When the heatsinks of the power mosfets heat up, the fan speed is increased. Should the temperature gets dangerously high, the phase control circuit lowers the output of the power supply, thereby protecting the power mosfets. Behind the Phase Control Regulation board is the power amplifier module. There are two heatsinks, one for each channel. Mounted onto the heatsinks are the world renowned Hitachi 2SK135 and 2SJ50 Lateral Power Mosfets. The PCR800 uses two pairs of mosfets per channel. The power amplifier board for the two channels is under the heatsinks and it extends all the way to the rear. As can be seen, the layout is extremely compact, so compact that two PCR800 units can be mounted side by side into a 19″ rack cabinet with a special face plate sold by the manufacturer. The power amplifier itself is pretty conventional. Starting on the left, we can see the input is Unbalanced. That’s the reason why I said earlier that the PCR800 is probably for the hi-fi market because most pro amps will have Balanced Inputs. The input differential is a pair of MPSL01 TO-92 transistors (Q1, Q2). From there, the signal is direct coupled to a MM4003 TO-39 transistor (Q6). A 2N3440 transistor (Q4) is the current source. Q9 and Q12 act as buffers to the VAS (Voltage Amplifier Stage) and they drive the power mosfets Q10, Q11, Q13, Q14. Strangely, the PCR800 does not have a feature to adjust the DC Offset at the output. My PCR800 unit has -43mV emitting from Channel A and -73mV on Channel B. They won’t harm my speakers but for an amplifier of this caliber, the omission is surprising. It’s a pity that Soundcraftsmen is no longer around. Their PCR concept was very innovative. 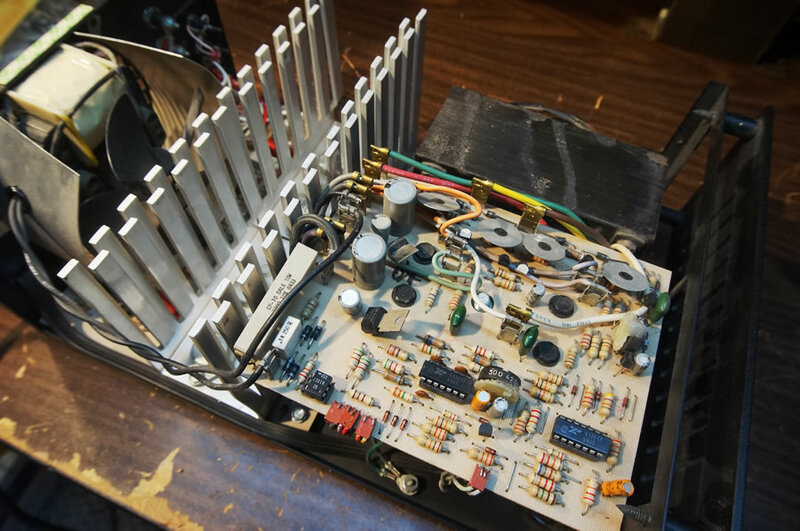 Even today, after so many decades later, the majority of power amplifiers do not have regulated power supplies. Perhaps it failed to make an impact is because consumers were adversed to the use of thyristors in the power supply. The chopping off action of the thyristors do generate harmonics in the Mains which some customers feel is detrimental to their hi-fi systems. 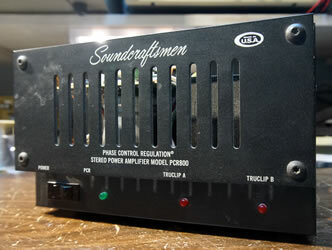 Nonetheless, this Soundcraftsmen PCR800 is a cherished member in my amplifier collection of an era gone by. It is in full working condition and has never been repaired before. It will not be lost in history.